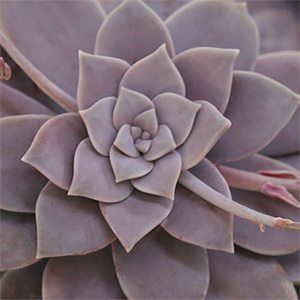 Graptopetalum are a rosette forming type of succulent originally from Mexico and nearby areas. Flowering in summer, they make excellent plants for growing in containers. Try them as individual feature plants or let them grow into a larger clump. This is a genus originally from Mexico to Souther USA. The species do vary a little in growth habit, some varieties being very flat in habit, others being bushy or taller growing. All have fleshy leaves and flowers vary from white through to pink in colour. The flowers appear on tallish stems above the foliage. All types require a well drained soil, a specialist succulent and cactus mix is best. A position in full sun is best for most Graptopetalum species, although a few will grow well in light shade. Most gardeners grow Graptopetalum in containers although in the right conditions they will grow well in the garden. Watering regime is important, over winter, very little water is required. During summer, water regularly allowing the soil to dry well between watering. Although these are not a plant that require a lot of fertiliser, they will benefit from a little liquid fertiliser during active growth. G. bellum – One of the few varieties that will grow in well in light shade. A very tight rosette of triangular shaped leaves. Pink flowers on a tall stem in summer. Also known as Tacitus bellus and the Chihuahua Flower. G. Murasaki is a hybrid, the foliage change colour dramatically with the amount of sun it receives. G. mendozae – Smaller foliage than most with an attractive spreading habit. G. paraguayense – One of the more commonly grown species commonly called the Ghost Plant. Excellent in a container where it will branch and flow over the edges. Lavender pink to pale green foliage which give in another common name of ‘Mother of Pearl plant’. All varieties have foliage that will change colour depending on the amount of sun they receive.